Thousands of US and German troops, along with tanks and equipment, are being sent to Poland and countries bordering Russia, purportedly in "defense against Russian aggression,” author and journalist David Swanson told RT. Europe is preparing to counter a perceived 'Russian military threat.' NATO countries in the East of the continent are awaiting the arrival of thousands of American soldiers as a part of a US-led battle group. The troops will be stationed along the Russian border from Estonia to Bulgaria. However, ships carrying the first batch of troops were greeted in a German port by signs reading "Army Go Home." Scores of protesters marched through Bremerhaven, urging an end to the Alliance's saber rattling. RT: Sweden is accusing Russia of spreading fake news in a bid to stop the country joining NATO, which has sent forces to Russia's borders. Do you think the fake news accusations spurred NATO to act? David Swanson: Well, from the point of view of the US more than Sweden, I can say the members of the Department of so-called Defense in Washington DC are almost openly talking to the media about profit being the motive for stirring up hostility with Russia. 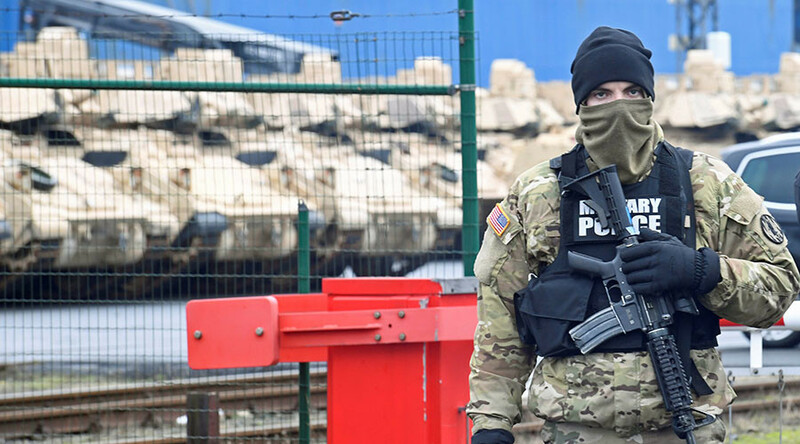 But this sending of thousands of troops – US and German – to Poland and countries on Russia’s border along with tanks and equipment – this is being done in the name of “defense against Russian aggression.” So unless you’re able to pretend there has been Russian aggression, you’re not going to be able to continue this. All this aggression has to be defensive. If Russia says otherwise, then what Russia is saying must be fake news. RT: NATO is preparing large numbers of troops due to Russia's alleged instability and aggression, but isn't NATO being the aggressive party here? DS: I think there is, starting from Washington DC, a major push to do everything possible in the next two weeks to create unending hostility between the West and Russia that can’t be undone by Donald Trump or anyone else. Even at the risk of open violence, rather than simply Cold War hostility. This is highly preferable to weapons profiteers as against actual peace breaking out, which is their greatest fear. RT: Obama promised to send more troops to Europe and today the first soldiers arrived in Poland. How do you expect Trump's imminent presidency to affect this operation? — RT (@RT_com) 6 января 2017 г.
RT: How likely do you think it is that we will see actual escalation between Russian and NATO forces? DS: I don’t know if it is simple or not, but it is clearly an escalation that involves numerous facets including propaganda about Russian crimes in the US media; that includes shipping troops and equipment to the border; that includes expanding NATO and pushing hard on other NATO members to join in this escalation where you have serious protests in Germany by those who want peace [and are] against sending Germans or Americans from Germany eastward, as they should. There are not enough of us in the US similarly protesting. RT: How long will Washington’s aggressive behavior continue against Russia? DS: I don’t know. Indefinitely, if it is up to the Pentagon and NATO headquarters. It could be two weeks, and there will be a major change. Because the US is the deciding element here and everything has been put in the hands of the President. We do have a brand new Congress in Washington DC - a Congress that under the US Constitution is supposed to decide all important matters, and a Congress in which not a single person ran on a campaign of this sort of escalation with Russia or against it. Just as in the presidential election. We have this huge ordeal about the protecting the US election from informing the US public of what happens during it. Nobody campaigned on escalating hostility with Russia or against it; it wasn’t voted on at all – this is just being done against the will of the US public if they were properly asked and polled about it but in the name of democracy… As if this sort of aggression and arms race is a force for peace and security when of course it is not. But this is the message that is put out by the US State Department.